The Peninsula Chamber of Commerce has confirmed that the Brisbane Water Oyster Festival is all set for November 11 at its new location at the Ettalong Markets. “The Oyster Festival will be held on its traditional day, the second Sunday of November, on November 11 from 9:30am to 4pm with all the usual attractions,” said Chamber President, Mr Matthew Wales. “The day includes fine wine from our neighbours in the Hunter Valley, craft beer from the local Six String Brewery and food from around the world,” he said. 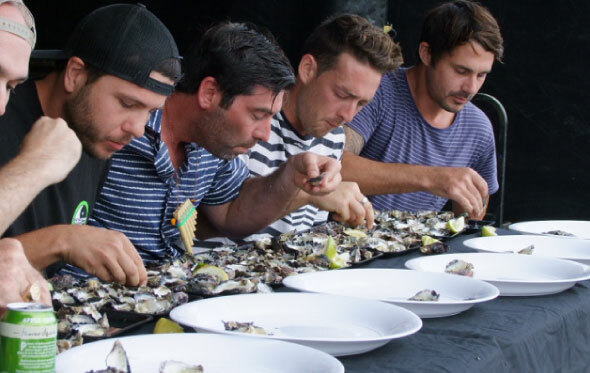 “There are also over 50 retail stalls to peruse while listening to a full program of live, on stage entertainment, and of course the iconic Oyster Eating Competition with oysters provided by Rockin’ Oysters. “A minute’s silence will be held at 11am with the Ode and Last Post to commemorate the 100th Anniversary of Armistice Day. “We already have a big crowd participating in the popular How Many Oysters Can You Eat in 30 Seconds, one of the highlights of the day. “Entertainment is organised by G’Day Hollywood Productions (Australia) who have supported the Brisbane Water Oyster Festival since its inception. “Entertainment will include On the Prowl and Neon Lights on the big stage with plenty of other activities happening throughout the event. “Other exciting additions to the Oyster Festival will include Broken Bay Pearls who will be giving a demonstration on the local pearl industry which provides an important value-add to the Brisbane Water oyster industry. “The Rotary Club of Umina will also be assisting at the event with a gold coin donation being sought from visitors with part of the proceeds going to Drought Relief Support for our New South Wales farmers.